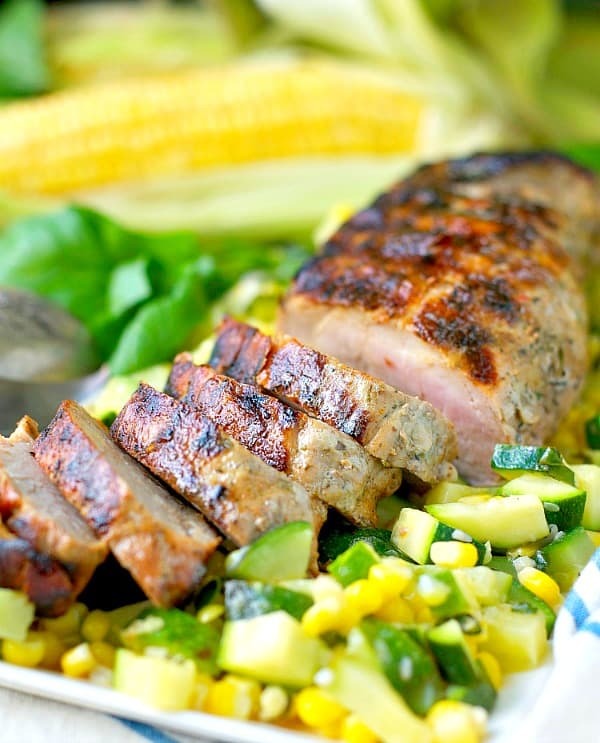 A low calorie and healthy dinner of grilled garlic and herb boneless pork tenderloin served with zucchini and corn, full of flavor and ready in only 30 minutes! 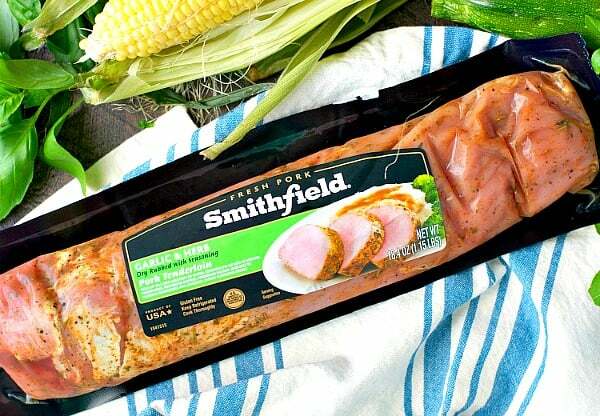 Sponsored post written by me on behalf of Smithfield® Marinated Pork. 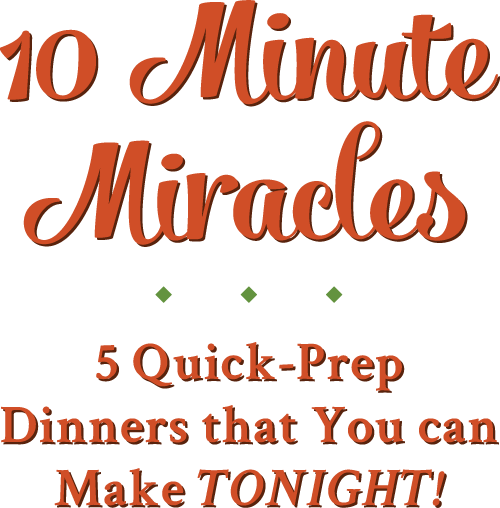 A fresh, healthy, and low calorie dinner is just 30 minutes away! 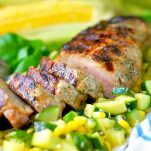 This easy Grilled Garlic and Herb Boneless Pork Tenderloin with Zucchini and Corn is a fast weeknight meal that the whole family will love. Oh, my. Y’all…I have found one of my newest favorite weeknight dinners! 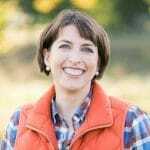 Just when you thought that a delicious and fancy-tasting grilled meal had to be reserved for the weekends, I’m here to challenge that assumption with one of the quickest and easiest suppers that you’ll have all summer! 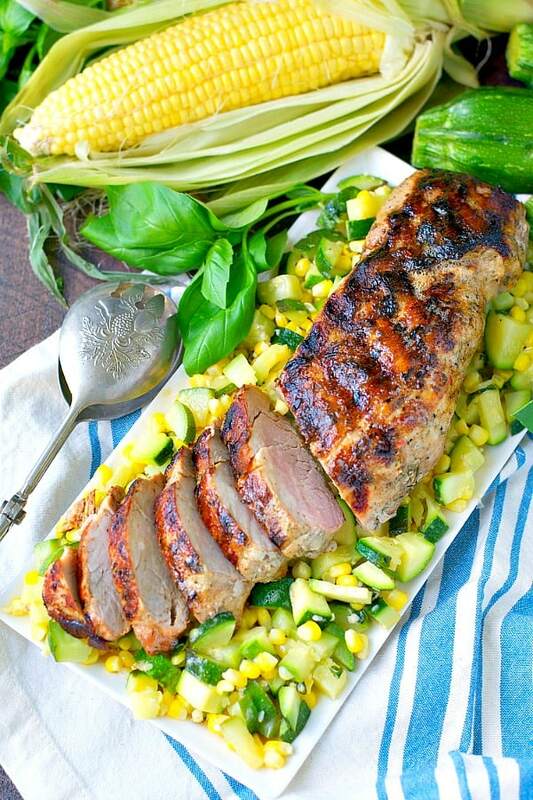 What to Serve Boneless Pork Tenderloin with? 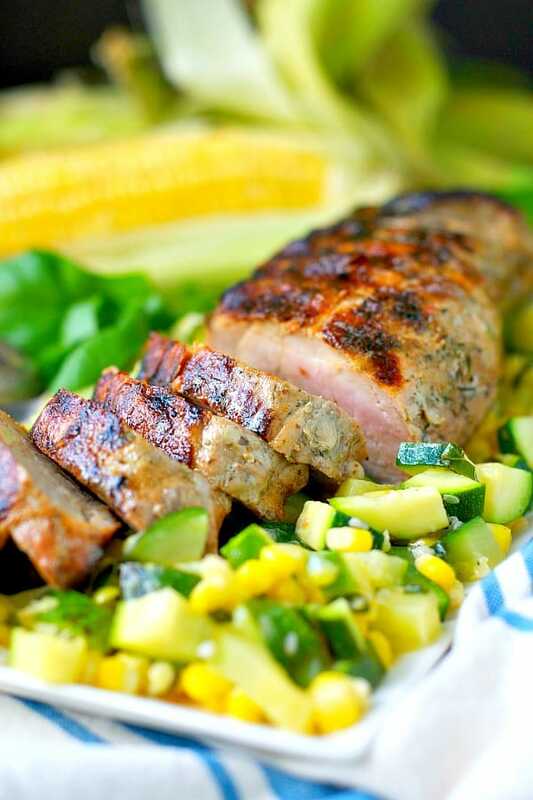 Since this pork recipe can be made in 30 minutes or less, I wanted to create an additional component to this dish that could be prepared quickly and easily while the tenderloin is on the grill. And since summer produce is abundant and affordable these days, why not enjoy it at its peak?! This is the ultimate fresh, FAST, and healthy dinnertime solution! The mild flavor and texture of zucchini is combined with a sweet burst of fresh corn and it’s all sautéed in garlic and fresh summer herbs — creating a flavorful and seasonal side dish that only requires a handful of ingredients. 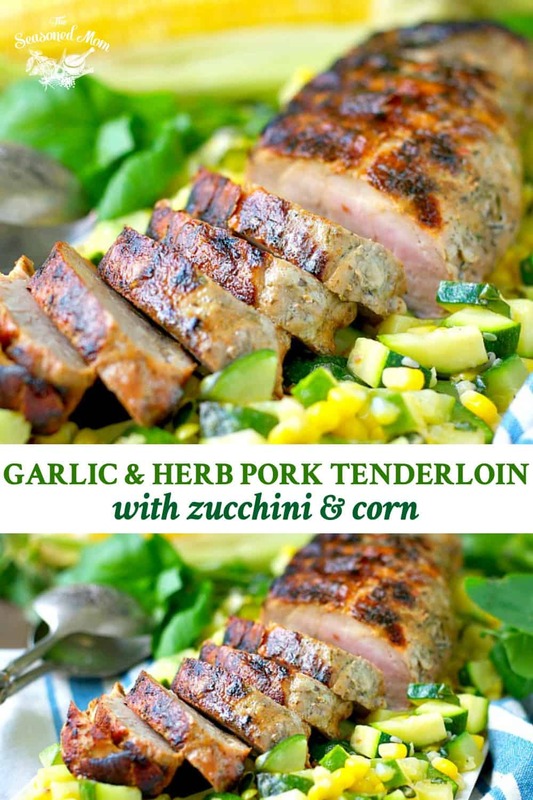 The flavors in the veggies pair beautifully with the garlic and herbs in the pork marinade. Seriously, we DEVOURED this dinner (on a random Wednesday night)! Cooking the tenderloin on a medium grill will take around 18-30 minutes but a great way to check it’s cooked perfectly is to use a meat thermometer. Insert the thermometer into the thickest part of the meat, it needs to be 150F to be cooked through. Cook the vegetables as the meat cooks so everything is ready on time. Take the pork out of the fridge at least 10 minutes before as cooking it straight from cold will cause it to tighten and toughen up. Let the meat rest for 5-10 minutes after cooking to ensure it’s extra juicy. 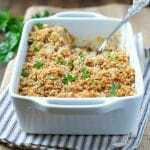 Leftovers are great, try slicing the pork and filling sandwiches or using in salads. Heat charcoal or gas grill to medium. Grill tenderloin 18-30 minutes, or until it reaches an internal temperature of 150 degrees F when measured in the thickest part of the meat. Let stand 10 minutes before slicing. In a large skillet, melt butter, salt, pepper, basil, and garlic over medium-high heat. 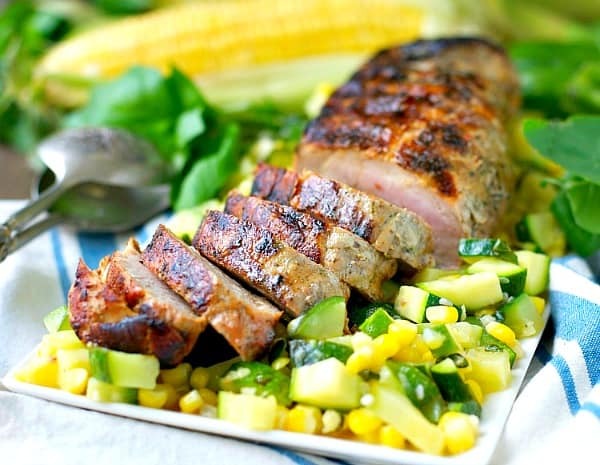 Add the zucchini and corn, COVER, and cook until just tender (about 5 minutes). You will probably need to remove the lid during the final minute or two to allow most of the moisture to evaporate. TO BAKE THE PORK TENDERLOIN IN THE OVEN: Preheat the oven to 425 degrees F. Place the pork tenderloin in a dish or on a baking sheet. Bake for 25-30 minutes, or until the pork reaches an internal temperature of 150 degrees F.
Cooking the tenderloin on a medium grill will take around 18-30 minutes but a great way to check it's cooked perfectly is to use a meat thermometer. Insert the thermometer into the thickest part of the meat, it needs to be 150F to be cooked through. Let the meat rest for 5-10 minutes after cooking to ensure it's extra juicy. Mmm what a delicious summer meal, Blair! 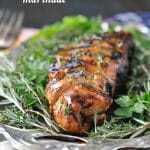 I love garlic herb meat, so this pork tenderloin sounds amazing. 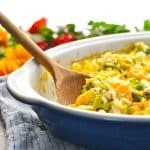 And that corn and zucchini mix sounds perfect for using fresh produce! 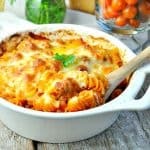 This is a delicious weeknight dinner! I’d love to sit down to this after a long day! 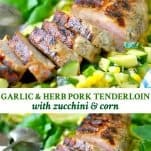 What a delicious summer meal, I love the idea or serving it with zucchini and corn, yum!